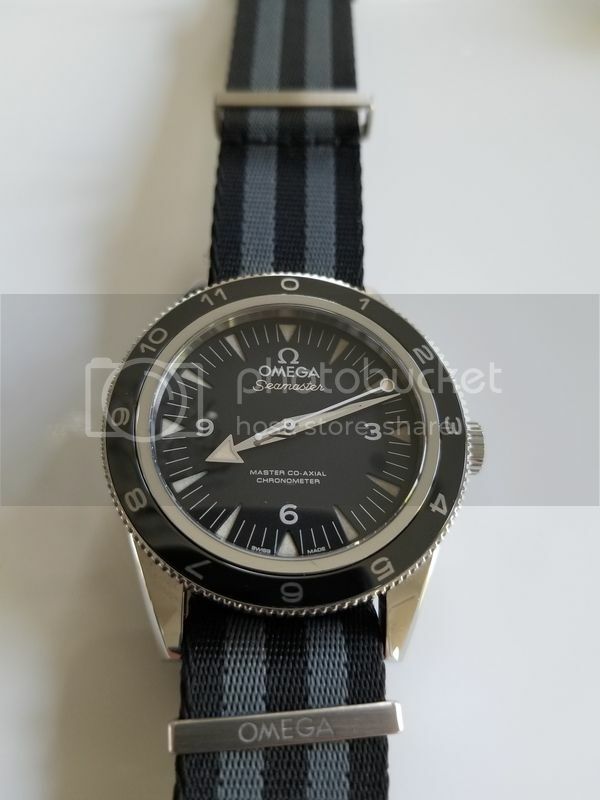 TimeZone : Omega » For those with the Spectre Seamaster 300, any long-term feedback about the piece? Don't see much discussion about it here and would appreciate some feedback from owners. Thanks! Awesome watch that has aged well. Was my daily wear until I got the Commander. NATO has held up well. Looks like values have held steady as well. I like my piece as well, elegant-looking, simple and functional with second time using the bezel. I cycle between this and GMT II ceramic on business travel. Placed a Camille Fournet black leather strap with yellow stitching to match the patina hour markers. Best. 21mm lug width and most straps are 20mm or 22mm. Which one fits better on the watch? I like the NATO but don't like having to loop back the extra bits due to its length...wished Omega would offer a shorter version! Are you looking for a leather strap or nato strap? I had a customized leather strap made through Camille Fournet's online service (lots of options to choose from) and they offer 21 mm wide straps. I have not looked at other custom watch strap sites. But I like the strap I received from them. Other folks may also recommend other vendors. good luck.